Place your hands on an elevated surface for an incline pushup. Incline pushups are similar to traditional pushups except that you position your hands on an elevated surface instead of on the floor. You may use a box, a table, or even a step outside for an incline. 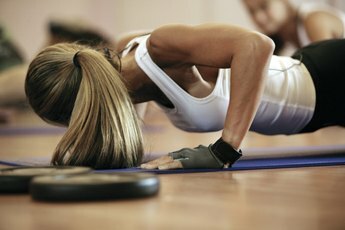 Doing the pushup in an incline position targets the same muscles as regular pushups, but offers an additional benefit if you're looking to build strength. The sternal head of the pectoralis major handles most of the work in the incline pushup.This is the largest muscle in the chest and it’s responsible for transversely adducting your shoulders, which means it pulls your arms together towards the center of your body. While the incline pushup is an effective stand-alone exercise if you want to improve general muscular strength, you can also incorporate the exercise into a more elaborate chest workout if you wish to significantly build chest muscle size. The shoulders and the triceps also contribute to the exercise. As you push up off the elevated platform, your shoulder muscles lift up your arms. The muscle in the shoulder is called the deltoid, and it’s the front of the deltoid that’s most heavily involved in incline pushups. 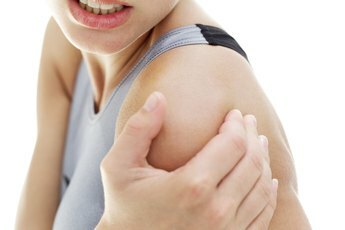 In addition, your triceps, located at the back of your upper arms, extend and straighten your elbows. You can place greater emphasis on your shoulders and triceps by bringing your hands into a more narrow position so that they’re placed about shoulder-width apart on the surface. As you perform incline pushups, your core muscles contract to hold your torso in a straight position. Throughout the entire movement, maintain a taut, straight position as you lower your body down towards the elevated surface and you rise back up. The muscles that isometrically contract to hold you in this position are the obliques, located at the sides of your torso, and your rectus abdominus, which is the largest muscle in your abdominals. Incline pushups are less challenging than traditional pushups because there’s more weight on your feet. If you struggle with the traditional pushup, the incline version targets the same muscle groups. The higher the elevated surface, the easier the exercise will be. 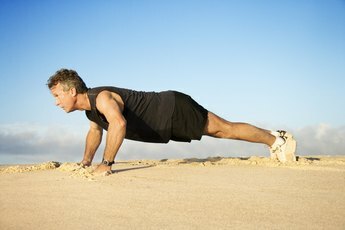 Once incline pushups are too easy, increase the difficulty of the exercise by moving into traditional pushup and then into decline pushups, where you hands are on the floor and your feet are on an elevated surface. What Muscles Does the Flat Bench Press Exercise Work? What Muscles Does the Incline Shoulder Press Target?